After a trying case, detective Merry Folger begrudgingly agrees to take a leave from work to meet her fussy future in-laws in Greenwich, but it isn’t long before she is summoned back to Nantucket. The body of a 21-year-old was discovered in the frigid waters of the Sound in the days leading up to the annual Christmas celebration, and the death isn’t sitting well with Merry’s father, the local police chief, who fears the track marks on the victim’s arms may be indicative of a growing drug problem on the island. Feeling a constant need to live up to her father’s expectations, Merry rushes home to her fiancé, Peter’s, annoyance, only to find that heroin isn’t the only destructive force in Nantucket. Soon after Merry arrives, she feels stonewalled by her father. If he was so desperate for her help, why won’t he share the details of the case with her? What is he hiding? 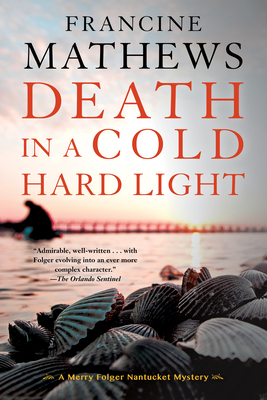 For the first time, Merry fears she cannot trust her lifelong role model—her own father—let alone figure out why a young athlete and Harvard scholar ended up dead in the frigid, storm-churned Sound. Francine Mathews was born in Binghamton, New York, the last of six girls. She attended Princeton and Stanford Universities, where she studied history, before going on to work as an intelligence analyst at the CIA. She wrote her first book in 1992 and left the Agency a year later. Since then, she has written twenty-five books, including four other novels in the Merry Folger series (Death in the Off-Season, Death in Rough Water, Death in a Mood Indigo, and Death on Nantucket) as well as the nationally bestselling Being a Jane Austen mystery series, which she writes under the penname Stephanie Barron. She lives and works in Denver, Colorado.